The League of Regrettable Superheroes is like a who’s-who of the Superhero D-list. Over the course of 256 pages and spanning 75-years of comic book history, author Jon Morris pays homage to some of the strangest and lesser-known superheroes (and heroines) that ever saw the light of day on a printed page. The book is divided into three eras: Golden (1938-1949), Silver (1950-1969), and Modern Ages (1970-present) and chronicles 100 colorful examples across the three time periods. Each section begins with a brief introduction to the era, providing context and highlighting trends in the comic industry at the time. The character profiles in The League of Regrettable Superheroes are drawn from the material of Morris’ long-running blog on the same topic, Gone & Forgotten. Each profile includes a minimum two-page spread, consisting of cover or panel art, a brief character bio, the names of the artists and writers who created the character, and the comic book in which each character made his or her debut. A majority of regrettable heroes are drawn from the Golden Age, a time when the comic book industry was still finding its legs. Lowlights include Madam Fatal (1940) – a critically acclaimed character actor that dresses up as an old woman to fight crime – and The Eye (1939), a crime-fighting, disembodied, floating giant eyeball. Standouts in the Silver Age are Fat Man (1967) – a heavy-set guy who fights crime by turning into a human flying saucer – and The Legion of Super-Pets (1962). Rising to the top in The Modern Age is Thunderbunny (1982) – this giant pink rabbit with super powers and clad in spandex probably deserves an entire book dedicated to his exploits! 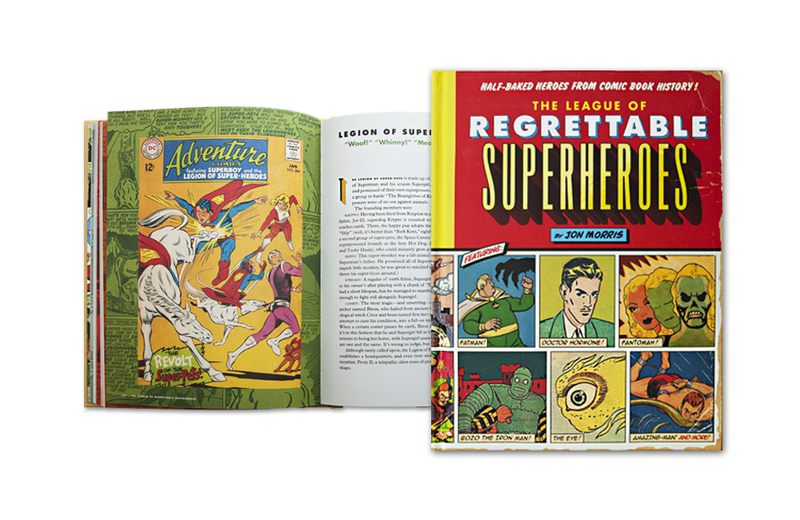 The sheer number of one-hit wonders and characters with dubious names, super powers, and back stories make The League of Regrettable Superheroes a fun read. The layout of the book is also top-notch, and the main character art is a pleasure to behold. Morris’ commentary is well-written, filled with historical detail, and usually delivered with a side of snark that is both humorous and respectful at the same time.